Despite the temptation to think of parks as urban preserves, they’re shaped by their times as much as any other city space. Prospect Park, starting today, is permanently car-free — except for emergency and park services vehicles — a culmination of decades of activism. But the ban is only a continuation of a centuries-long conversation about the city’s public spaces, who they serve, and what their purpose ought to be. Modern New York desperately lacks spaces where people can simply exist — without the expectations of spending money, of being in anyone’s way, of bothering others with their mere existence. In a place like New York, this is both a perfectly reasonable request and asking entirely too much. Roads are, for example, a place where you’re in a car’s way. Whatever your vision of an ideal city may be, it’s unlikely to involve getting honked at while riding a bicycle through a park. But the following generations of park administrators didn’t always share Olmsted’s view. In 1918, Brooklyn Parks commissioner John Harman decided that Prospect Park had not adequately kept up with the times. The gravel drives circumnavigating the park — what we now call the Prospect Park Loop — were paved over with asphalt to further usher in the era of the automobile, and the road was made one-way eight years later to cut down on the hundreds of accidents that occurred in the park every year. But it wasn’t just about cars. The very idea of Olmsted’s oasis had fallen out of favor. As cities became overcrowded and stuffy, some viewed lush, luxurious parks as an indulgence they could no longer afford. Instead, they had to be places people went en masse to participate in activities. As president of the Park Association of New York City Nathan Straus Jr. (son of the Macy’s co-founder) wrote in 1931, America had fallen behind the far superior, to his view, European parks that featured large sun-bathing lawns, swimming pools, and open-air cafés. Specifically, he identified Prospect Park as “an example of what to avoid in developing new areas,” because it was just trees and stuff. With the help of infamous city policy titan Robert Moses, who served as the city’s parks commissioner alongside many other roles, the city’s green spaces became places to put things: playgrounds, outdoor concert venues, organized sports fields, and other event-based activities. To build on Giddens’s phrase, during this era parks were not a place to get away from stuff, they were a place to put more stuff. Naturally, this utilitarian approach to park space was more than welcoming to automobiles. In the meantime, Olmsted’s landscape had become neglected. A 1945 letter to the New York Times by Flatbush resident Janet Patrie, who according to voter rolls lived on Bedford Avenue just off Parkside, lamented Prospect Park’s state. “The hill to the west of the Lincoln Statue, formerly of great beauty with its shrubs, trees, and grass, has nothing now to show but the tracery of deep gullies over the bare earth.… This condition did not come about as a result of the war. The deterioration started long before.” Over subsequent decades, Moses worked to restore these features, but he also harbored a blatant disregard for Olmsted’s ideas. One story goes that when he found Olmsted and Vaux’s original Prospect Park designs in the Litchfield Villa during renovations, he had them thrown out. But even this mid-century utilitarian vision for parkland understood the car didn’t really belong. Instead, cars were accepted as a default fixture of modern society; they were never explicitly allowed because they were never explicitly banned. This changed in 1966. As cycling and jogging became popular hobbies once again, Parks commissioner Thomas Hoving wanted to close Central Park’s East and West drives to vehicle traffic on summer weekends. But the city’s traffic commissioner, Henry Barnes, refused, arguing Central Park’s roads were an extension of the city’s and therefore should fall under his jurisdiction. He further fretted that closing roads inside the park would soon lead to closing the ones just outside of it, such as Central Park West and Fifth Avenue. If only. Oh, but it worked. The next two decades saw a gradual expansion of car-free park days to include Saturdays, then weekday off-peak hours. Those were then reciprocated at Prospect Park as well. These victories galvanized New Yorkers who saw a non-car-centric future for the city. Thanks to decades of work from transportation activist groups like Transportation Alternatives, including protests and petition drives that took off in the early 2000s, car access to the city’s premier parks has never been more limited. A totally car-free Prospect Park — a designation even Central Park cannot claim — is just another evolution in the unceasing dialogue over what the city’s public spaces ought to be and whom they serve. The latest answer, the one in which we are currently living, is a compromise between Olmsted’s safety valve and Moses’s functionality, brokered by public-private partnerships. The Prospect Park Alliance has restored much of the vision of Olmsted — who, it should be noted, worked to conceal the roads from the park itself and almost certainly would have disdained motor vehicles being permitted inside his gem — while still making the park hospitable to “stuff” such as major events, organized sports, concerts, and food festivals. But we, as a society, have also adopted a definition of public space anathema to Olmsted’s. In 2000, to raise awareness for a city program that encourages private developers to provide spaces for the public in exchange for more generous zoning rules, the city published a booklet with a title far more damning than I suspect was intended: “Privately Owned Public Space: The New York City Experience.” The city claims to have generated more than 3.5 million square feet of public space from the 333 buildings benefiting from the program since 1961. I challenge you to name one. The Privately Owned Public Space (POPS) program does far more to illustrate the limits of such a scheme than its benefits. The city’s comptroller has twice found that most POPS violate the program’s rules by restricting public access. 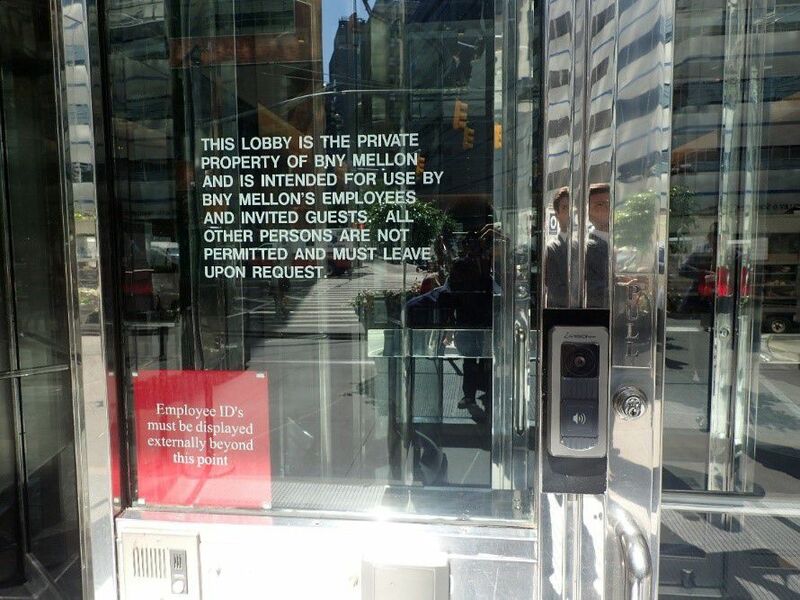 One such space, the lobby of 101 Barclay Street, even had a permanent inscription on its glass door identifying the lobby as private property intended solely for the use of employees or invited guests. It’s increasingly difficult to envision a city government creating anything resembling the two public spaces we have left: parks and libraries. They’re relics of an age when the Greater Good didn’t mean job creation or tax incentives or trickle-down economics. They must be preserved with ferocity. Getting cars booted from the park is not a mere symbolic victory. Cars are the ultimate privately owned public space. By banishing them, we restore just a little bit of Olmsted’s vision, which was so attuned to timeless worries. We may need it now more than ever.